We act as credit brokers and we are not a lender. We will introduce you to a limited number of lenders who may be able to help finance your purchase. These lenders may or may not pay us for the introduction. Business users only. Finance subject to status. A guarantee may be required. Terms and conditions apply. Unless otherwise stated, metallic paint at extra cost. Library image for illustration purposes only. All prices exclude VAT. Initial payment of £1,425.69 +VAT followed by 47 monthly payments of £158.41 +VAT with one final payment of £4811.50 +VAT. Based on 8000* miles per annum. Business users only. *Excess mileage and damage charges apply. Finance subject to status. A guarantee may be required. Terms and conditions apply. Unless otherwise stated, metallic paint at extra cost. Library image for illustration purposes only. 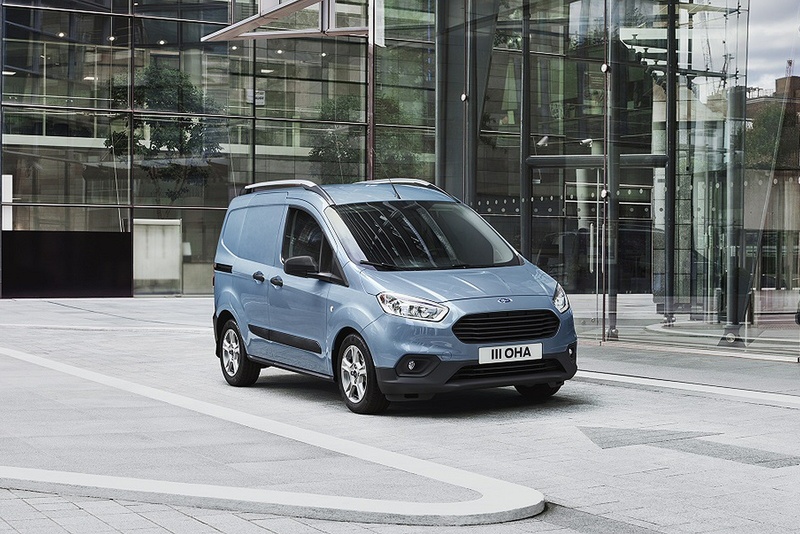 The Ford Transit Courier is the fourth LCV model in a range that also includes the Transit Connect, the Transit Custom and the full-fat Transit van. This is the smallest model in the range, but it's no tiddler when it comes to cargo capacity with a class-leading load length and a payload of 660kg. This improved version gets smarter looks and a redesigned cabin. When it comes to vans, one size most certainly doesn't fit all. Van users have hugely diverse needs and the fragmentation of the van market into varying different size classes has provided manufacturers with the opportunity to really tailor vans to specific purposes. Take this Ford Transit Courier. You used to know where you were with a Ford Transit. It was a big, blocky thing, built in Eastleigh and it had all the sophistication of a stag weekend in Magalluf. Buyers loved it though. It was rugged, inexpensive and did the job. These days though, the Ford Transit is a brand that encompasses a number of different models. It's a lucrative strategy too, with the upswing in commercial vehicles sales post-recession. Here, we're looking at the smallest member of the Transit retinue, the Transit Courier. Although you don't get any choice when it comes to Transit Courier body styles, you'll need to come to a decision about the oily bits under the bonnet. Meeting the latest Euro 6.2 emissions standards, the updated powertrain line-up in this revised model offers customers the choice of fuel-efficient 75PS 1.5-litre TDCi diesel and a 100PS 1.0-litre EcoBoost petrol unit. All vehicles feature Ford's latest six-speed manual transmission in place of the previous model's five-speed gearbox, offering improved shift quality, refinement and contributing to better real-world fuel-efficiency. On the move, the chassis is torsionally very stiff and the tuning of the suspension components and steering system has resulted in decent ride comfort, along with the sort of precise and agile handling you'll need when negotiating city streets. City vans need to do that seemingly impossible thing of being big on the inside but as small as is practicable outside, which is one reason why they all look much of a muchness, namely a cube and a bonnet with the marque's family face grafted on the front. The Transit Courier doesn't deviate too far from this template although the steeply raked windscreen does give it more of a one-box look. Couple that with the typically hefty Ford front grille and some subtly flared wheel arches and it looks handsome. You could see a few of these being converted to neat looking surf vans with the right wheels and paint. Recent revisions include a refreshed front-end appearance that incorporates a reshaped grille opening. But the Courier isn't just about looking good. It's also about making the working environment easy and hassle free. Get inside and you'll find well-sculpted front seats and a dashboard that wouldn't look out of place in a family car with a colour display panel on the dashtop, nice use of metallic finishes, wheel-mounted audio controls and a centre console that's pretty close to what you'd get if you'd bought a new Ford Fiesta. That's no real surprise as the Transit Courier rides on Ford's global B-segment chassis which underpins cars like the B-MAX, the EcoSport and, yes, the Fiesta. 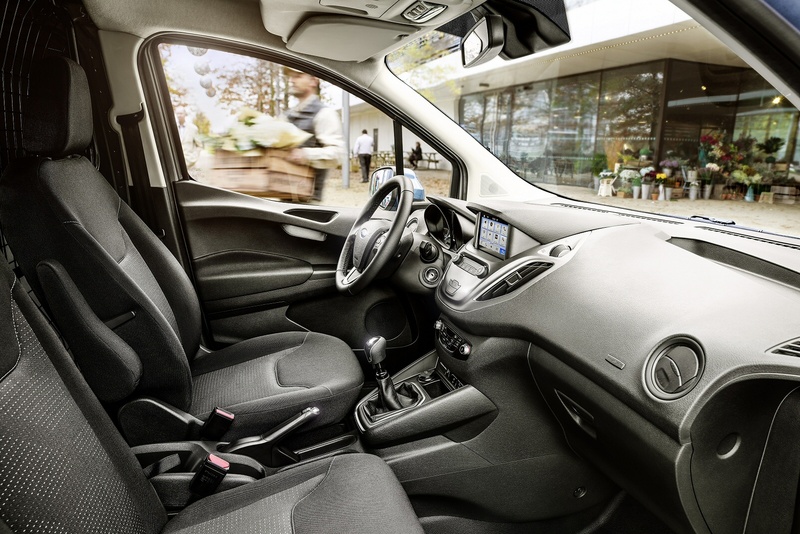 The cabin of this revised version features a redesigned centre console including a larger six-inch colour touchscreen with Ford's SYNC 3 communications and entertainment system. 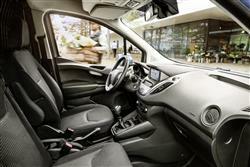 The Transit Courier is priced in the £12,500 to £15,500 bracket (excluding VAT). It competes directly with small city van models like the Citroen Nemo, the Peugeot Bipper and the Fiat Fiorino, all of which cost similar money. Ford has targeted owner-drivers with plusher 'Sport' and 'Limited' variants at the top of the range. Luxury options include a voice-activated in-car connectivity system, a Rear View Camera, Easy Fuel, Speed Limiter and standard ESC (Electronic Stability Control), plus a class-leading variety of safety features. Perhaps the neatest optional touch though is the clever 'Ford SYNC 3 with Emergency Assistance' set-up. Through this, you can work MP3 players, Bluetooth-enabled 'phones and access USB drives with voice commands, plus get text-to-speak messaging. Most importantly, the system automatically calls the emergency services in accidents where the airbags are triggered. If you�re looking for a new Ford Transit Courier Diesel 1.5 TDCi 100ps Sport Van [6 Speed] for sale, you�ve come to the right place. At Bristol Street Motors we don�t just have the best Ford Transit Courier Diesel 1.5 TDCi 100ps Sport Van [6 Speed] deals, we also offer friendly advice and help with all your enquiries to ensure your buying experience is a happy experience.